On the Thursday of SXSW, I had the unique opportunity to attend the celebrated Luck Reunion, hosted at the Luck, Texas ranch of legendary country songwriter Willie Nelson. The Luck Reunion’s stated mission is “to cultivate the new while showing honor to influence”, among “musicians, artisans, and chefs, who like the outlaws and outliers before them, follow their dreams without compromise.” The event is staged at Nelson’s home and working ranch, which is about a 45-minute drive from downtown Austin, and which presents a very different atmosphere from the hectic SXSW schedule of conferences and showcases. Once arrived at the Luck Ranch, I didn’t have much time to get acquainted with the surroundings before the full day of music was set to begin. I took a quick peek into the tiny Luck Chapel to catch a couple of songs from Nashville songwriter Lilly Hiatt, whose quirky combination of folky Americana and grungy rock sounds can be heard on her recent third album ‘Trinity Lane’. Next, I headed outside to the Revival Stage, which was hosting a “song swap”, including a pair of songwriters I was keen to hear, Arizona native singer Courtney Marie Andrews and soulful Nashville songwriter Sam Lewis, who were joined onstage by fellow songwriters Caleb Caudle and Kevin Kinney (of Drivin’ N Cryin’). I’m not sure if the song swap was intended to be more interactive among the performers, but in practice, the four artists simply took turns singing their own songs, rather than actually swapping. That said, I was especially excited to hear songs from Andrews’ excellent recent album ‘May Your Kindness Remain’, and Lewis’ upcoming LP ‘Loversity’. All four singers made a strong impression of the quality of songwriting on display at Luck. Immediately following on the same stage, Buck Meek (also known to TGTF readers as part of Big Thief) played a set of his solo tunes, including one, ‘Sam Bridges’, that I vaguely recognized from a Big Thief show back in 2015. I was able to catch Meek after his set for a quick chat about that song as well as the new ones on his forthcoming self-titled solo LP. Stay tuned to TGTF for that interview, which will post in the coming days. After chatting with Meek, I had an appointment for another interview, this one with the aforementioned Sam Lewis. Outside the Luck Chapel, he and I took seats on an old wooden swingset, which was both novel and remarkably sturdy. (Thanks to Sarah for the photo above.) Lewis was outgoing and easy to talk to, and we chatted extensively about his upcoming LP ‘Loversity’, which is due out on the 4th of May. Be sure to check back with us for the forthcoming full interview, where he expands on the album’s unusual title as a theme for the songs it contains. My next stop was at the Back to the Source Stage for Austin native songwriter David Ramirez. I’d spied Ramirez and his bandmates earlier, walking around the Luck Ranch and enjoying the beautiful day ahead of their set. The informal atmosphere seemed very much to Ramirez’ liking, and he played a gorgeous show for the occasion, finding a pitch-perfect blend of old songs and new ones alike. He and his band were in top form here, showcasing themselves collectively under the newly minted moniker David Ramirez and the Hard Luck. I had noticed in passing that the Luck Chapel had a constant queue outside it throughout the afternoon. With a capacity of only 50 people, the intimate stage was in high demand all day long, but never more so than for British singer/songwriter Jade Bird. Disappointed that I wasn’t able to get inside to see her performance, I went around to the side of the building and spectated through an open window. The collection of punters standing outside with me were as delighted with Bird’s performance as the lucky ones who’d gotten in, and she quickly gained a reputation as “one to watch” for the remainder of SXSW. I was fortunate to hear Jade Bird sing again the following morning; keep an eye on TGTF for my Friday recap. From there, it was a quick few steps back to the Revival Stage, where I saw a pair of rather unusual acts, Hop Along and Ezra Furman. Hop Along were unfamiliar to me, but I took an instant liking to lead singer Frances Quinlan’s voice. Their new album ‘Bark Your Head Off, Dog’ is an odd but appealing collection of songs painted with a broad sonic palette, out now via Saddle Creek. I was slightly more familiar with Ezra Furman, and the Luck Reunion seemed at first glance an odd choice of venue for his brand of angsty rock. However, if the event’s focus was indeed on “outlaws” of songwriting, Furman was in the right place, despite the oddity of seeing him perform in typically-female attire against the backdrop of a functional stable and horse pen. His recent fourth solo album ‘Transangelic Exodus’ is a brilliant and bizarre display of lyrical storytelling, out now on Bella Union. By this point, I needed a break before hitting the World Headquarters Stage for evening sets by Lukas Nelson and the Promise of the Real, Kurt Vile, Nathaniel Rateliff and the Night Sweats, and of course, Willie Nelson and Family. Drinks at the Luck Reunion were complimentary and freely flowing at various locations throughout the day, but I took this time out to avail myself of the food choices provided by a selection of local vendors. There was no shortage of delicious options, and if you appreciate a deftly-designed culinary experience alongside your carefully-curated music, then the Luck Reunion would certainly be your cup of tea. Stay tuned to TGTF for my Thursday evening recap, which will include more from the Luck Reunion as well as two late night shows back in downtown Austin. American singer/songwriter Courtney Marie Andrews released her seventh studio album last month, just after she performed at SXSW 2018. You can read Carrie’s review of ‘May Your Kindness Remain’ through here. This week, she has a new video out for ‘Took You Up’, which Carrie described as a well-worn love song. You can watch the promo for it below, which takes the idea of first light as a metaphor for finally seeing things clearly. ‘May Your Kindness Remain’ is available now from Mama Bird Recording Co. (America) / Loose Music (UK). All of our past coverage on Courtney Marie Andrews here on TGTF is through this link. Alt-country singer/songwriter Courtney Marie Andrews appeared last week in Austin for SXSW 2018, to preview her forthcoming seventh album ‘May Your Kindness Remain’. Andrews garnered attention in the UK last year with the re-release of ‘Honest Life’, her self-produced sixth record, which drew comparisons to Laurel Canyon-style folk artists like Joni Mitchell. But where ‘Honest Life’ had more of a folk flavour, ‘May Your Kindness Remain’ finds itself firmly in the country category, albeit a more old-school, traditional country sound than you might hear on mainstream radio on either side of the pond. The people that I’ve met on the road these past few years got me thinking about my childhood, and the people around me that I’ve known, and the stories that come from my family,” Andrews says. “It became clear how many people are struggling through the same issues. People are constantly chasing that bigger life. A lot of people are poor in America—and because of those unattainable goals, they’re also mentally unstable, or sad, or depressed or unfulfilled. A lot of people—myself included at some point in my life—are loving somebody through this. That’s sort of the theme of the record: coming to terms with depression and the reality of the world we’re living in. Gospel-tinged title track ‘May Your Kindness Remain’ addresses that idea in straighforward fashion, but with an underlying message of optimism. Lyrics like “fortune might buy diamonds, all shiny and new / but it can’t buy you happiness or love, that is true” might seem trite when written on a blank page, but they ultimately ring sincere when couched in Andrews’ simple melodies and her gently yodeling folk-country vocal style. The dynamic growth of her singing voice in the song’s powerful chorus showcases both strength and subtle emotion. Near the end of the tracklisting, the dryly ironic tone of ‘I’ve Hurt Worse’ displays a typically country-rock bravado and the emotional subtlety of trying to mask a pain you don’t want to admit to in the first place. “Mother says we love who we think we deserve,” Andrews remarks here in a wry tone, “but I’ve hurt worse.” The album closes with ‘Long Road Back to You’, which underscores the pervasive longing and quiet hope in this collection of songs. The guitar riff between its verses is achingly desperate, while Andrews’ vocal in the yearning refrain is a barely-restrained cry of loneliness. But the return of gospel harmonies in the piano and backing vocals manages to leave behind a prevailing sense of promise. Courtney Marie Andrews has made her career in music the hard-working, old-fashioned way, and her commitment to the traditional country aesthetic pays off in spades on ‘May Your Kindness Remain’. The album’s beauty lies in its simplicity, which highlights Andrews’ delicate balance of grit and grace. Her rough-around-the-edges vocal style infuses her lyrics with a sense of authenticity, and her dusty, sepia-toned soundscape conveys both steadfast resilience and hard-won hope. 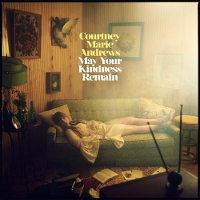 ‘May Your Kindness Remain’ is Courtney Marie Andrews’ seventh studio album and her second release for Mama Bird Recording Co. (America) / Loose Music (UK). The album is due out tomorrow, Friday, the 23rd of March. Stay tuned to TGTF for live coverage of Courtney Marie Andrews at SXSW 2018, to post in the coming days. Our past coverage, including Andrews’ answers to our SXSW 2018 themed Quickfire Questions, is back through here. As you might expect with an American music festival, SXSW is typically heavy on American showcasing artists, and SXSW 2018 won’t be any different. This year’s music festival lineup features a load of big names that you’ve probably heard before, along with a few new ones that, if they’re not familiar already, likely will become so very soon. Our ongoing preview coverage of SXSW 2018 has already highlighted a few up-and-coming artists on the showcase schedule, including grunge rock band Bully and alt-country singer Courtney Marie Andrews. Perhaps the most intriguing of these is elusive Los Angeles alt-rock trio Lo Moon, who made mild waves with their SXSW appearance last year. I expect them to make a bigger splash this time around, on the strength of their just released self-titled LP, which includes new track ‘Wonderful Life’. Among the major players heading to SXSW 2018 are a handful of TGTF alums who have broken through to mainstream success. We first covered songwriter Nathaniel Rateliff way back in 2011, but the course of his career dramatically changed in 2015, when he convened a new band called the Night Sweats and released their hit self-titled album. Nathaniel Rateliff and the Night Sweats have recently announced a brand new LP called ‘Tearing at the Seams’, which is due for release just before SXSW on the 9th of March and features lead track ‘You Worry Me’. North Carolina alt-pop duo Sylvan Esso previewed songs from their 2017 album ‘What Now’ at a surprise SXSW 2016 show; their appearance this year could once again herald new music on the horizon. Austin native David Ramirez wasn’t in top form when I saw him at SXSW 2017, but he may be in better shape this year, playing songs from his beautiful recent album ‘We’re Not Going Anywhere’, which he has toured extensively since its release. SXSW 2015 showcasing artist Natalie Prass has just announced a brand new album ‘The Future and The Past’ due out on the 1st of June; she will presumably highlight its soul-tinged single ‘Short Court Style’ on her showcases in Austin next month. Among other past TGTF mentions on the SXSW 2018 list are Nashville singer/songwriter Liza Anne, who will release her new album ‘Fine But Dying’ on the 9th of March and Milwaukee quartet Field Report, whose new album ‘Summertime Songs’ is previewed in the stream of ‘Never Look Back’ just below. Fellow Nashville singer Tristen and Philadelphia duo Vita and the Woolf, both acts we’ve coincidentally covered in conjunction with Irish alt-rockers Bell X1, also made the showcase list for this year’s festival in Austin, along with New York’s Sunflower Bean, who showcased at SXSW 2016, and L.A. rock band Warbly Jets, who made an appearance at SXSW last year. American artists new to TGTF include Albert Hammond, Jr. of The Strokes fame, and Buck Meek of alt-rock band Big Thief, neither of whom we’ve seen in a solo capacity before. Satellite radio listeners here in the U.S. might already be familiar with Mt. Joy and NoMBe, who have both been featured on SiriusXM Alt-Nation, while public radio devotees will no doubt have heard Portland singer/songwriter Haley Heynderickx and New Orleans funk/soul group Tank and the Bangas on NPR. For dedicated indie fans, a pair of duo acts, Denver’s Tennis and Baltimore’s Wye Oak have made the SXSW shout list, along with the always eccentric Okkervil River. In the heavily represented Americana category, sure winners include a trio of Nashville acts: singer/songwriter Nikki Lane, country rock trio Liz Cooper and the Stampede and veteran country/bluegrass collective Old Crow Medicine Show. Please note: all information we bring you about SXSW 2018 is to the best of our knowledge when it posts and artists and bands scheduled to appear may be subject to change. To learn when your favourite artist is playing in Austin, we recommend you first consult the official SXSW schedule, then stop by the artist’s Facebook or official Web site for details of any non-official SXSW appearances. American alt-country artist Courtney Marie Andrews left her home in Arizona at the tender age of 16, taking up a life of music and full time touring. Her official Bandcamp page shows a fairly lengthy list of early EP and LP releases, but Andrews’ major breakthrough came with her 2016 album ‘Honest Life’, which was picked up by Fat Possum/Mama Bird in the U.S. and Loose Music in the UK, and re-released in 2017. Less than a year has passed since that release, but Andrews already has a brand new album recorded and ready to go. ‘May Your Kindness Remain’ is due for release on the 23rd of March, just after Andrews’ scheduled appearance at SXSW 2018. ICYMI, we recently featured the album’s latest single ‘Kindness of Strangers’ as our Video of the Moment #2793. Andrews is one of the artists I’m most looking forward to seeing in Austin this year, and she was gracious enough to answer our set of Quickfire Questions ahead of the event. Read on to get better acquainted . . .
Is this your first time at SXSW? What have you heard about the festival? Are you excited / anxious / scared / etc. and why? I can’t believe after ten years of touring this will be my first SXSW. I’m hot-diggity ready! Ten years is too long to not attend and perform at one of the quintessential music festivals, as a full-time musician. Of the bands who have already been announced, are there any you’re particularly interested to see? If yes, who are they and why? I’m very excited to hear Marlon Williams play, ’cause I think he has an incredible voice. I’m also very much looking forward to playing at Luck Reunion and hear Willie [Nelson] play that night. I’ve been hearing about that part of the festival for years, and I’m very excited to finally experience it. I’m looking forward to rockin’ the hell out with my band and catching up with all my pals in the music world. I always pack one too many pairs of earrings and only ever end up wearing one pair the entire tour. Bad habit. Depending on the night. If it’s chill, a glass of Pinot Noir. If it’s rowdy, a shot of tequila. Somewhere in the middle, I’ll go for Gin & Tonics, Whiskey Gingers, Margaritas with salt, or Manhattans. My drink of choice is very mood oriented but those are my top picks. ‘Edelweiss’ from Sound of Music. ‘Respect’ by Aretha Franklin, or ‘Blue’ by LeAnn Rimes. What song always makes you laugh? ‘We’re Not the Jetset’ by George Jones and Tammy Wynette. What song always makes you cry? Jerry Garcia’s entire ‘Lonesome Prison Blues’ album reminds me of the time I spent four nights on a Greyhound bus on the way to New York. I sat next to some of the nicest prostitutes and convicts, and I felt like I had lived every lyric Jerry sang about on that record. Every time I see a Greyhound bus I feel the urge to listen to that record. Ooooh, that’s so hard. SO MANY. Off the top of my head, I’d say ‘Picture in a Frame’ by Tom Waits. A Bob Dylan and Aretha Franklin love child, in a perfect world. I would probably try my hand at writing novels, or try and become an anthropologist. Those are careers that always seemed to hold a lot of stories in them, and I could never do something that didn’t involve a story. Andrews has a full slate of shows lined up for her time at SXSW 2018; you can keep up with her showcase appearances by checking the official SXSW 2018 schedule. Following SXSW, Andrews will hit the road with her band for live shows in the North America, Europe, and Australia. Details of her UK and Ireland shows are right back here, and a full listing of her upcoming live dates can be found on her official Web site. Our thanks to Doug for arranging this e-mail q&a.